This craft is all about taking ugly wallpaper and transforming it into beautiful 3-dimensional flowers. This craft only has 3 steps and is pretty simple to complete once you get the hang of it. 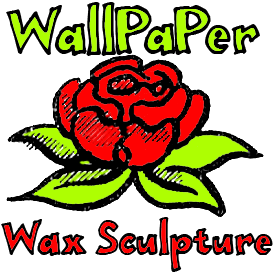 You will need an adult, such as mom or dad, to assist you with dipping the wallpaper flower structures into hot wax. But other than that, you can complete these on your own. 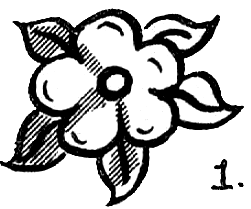 Cut out flower cluster from wall paper, as in Figure 1. Cut out several single flowers of the same design. 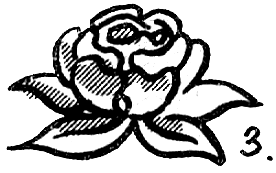 Cut hides of flower petals into center, as shown by broken line in Figure 2. With a two-pronged paper fastener, attach single flowers to center flower in flower cluster. 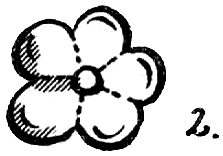 (Figure 1) Bend petals of top flowers upward. An adult should do this next part. Ask an adult to dip assembled flower into melted wax. These flower. will float, as in Figure 3.